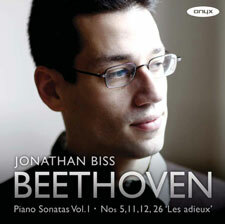 Jonathan Biss embarks on a fascinating journey through all 32 Beethoven sonatas. Spanning the years 1795 to 1822, these works contain some of the composer’s most profound musical utterances. Beethoven’s subtle transformation of the piano sonata form is extraordinary – from the Classical style of the early sonatas to the freer multi-movement structures of the visionary late works. The first volume in the series moves from the nervous intensity of the C minor Sonata op.10 no.1 to the sublime leave-taking of the ‘Les Adieux’ Sonata, taking in another elegiac essay with op.26. Read a fascinating interview with Jonathan Biss in the Daily Telegraph -'My mission to spread the word about Beethoven' here.